GreyFriars is situated at the top of East Hill, at the Eastern end of Colchester’s High Street, perfectly located in the centre of Colchester’s Cultural Quarter yet only a couple of minutes’ walk from the Town Centre. The Cultural Quarter is home to Colchester Castle (the largest Norman keep in Europe, built on the foundations of the Temple of Emperor Claudius of Rome), the Hollytrees Museum, the Natural History Museum, the Minories Art Gallery, FirstSite Modern Art Gallery, which is housed in a magnificent golden building designed by Raphael Vinoly, the ruins of St. Botolph’s 12th Century Priory and more. If you fancy a little shopping, Fenwick’s is a few minutes’ walk away at the west end of the High Street, together with a varied selection of independent and artisan shops as well as the high street multiples. GreyFriars is also perfectly positioned for exploring the Essex and Suffolk countryside. Constable Country is only ten minutes away by car – Flatford and the Munnings Museum at Dedham are certainly worth a visit; Mersea, the home of the Mersea and Colchester Oysters is a breath away and the marvellous Essex and Suffolk coastlines are equally accessible. On entering GreyFriars car park, bear carefully to the right and you will see the wrought iron gates into GreyFriars Hotel & Restaurant. There is an intercom at driver level on the right which communicates directly with Reception. Press the button, announce your name and the gates will be opened automatically for you. From Harwich, take the A120 in the direction of Colchester, leave at the junction with the A1232 and head in the direction of the Town Centre, on Ipswich Road and follow the directions above. The postcode to enter in your SatNav is CO1 1UW. 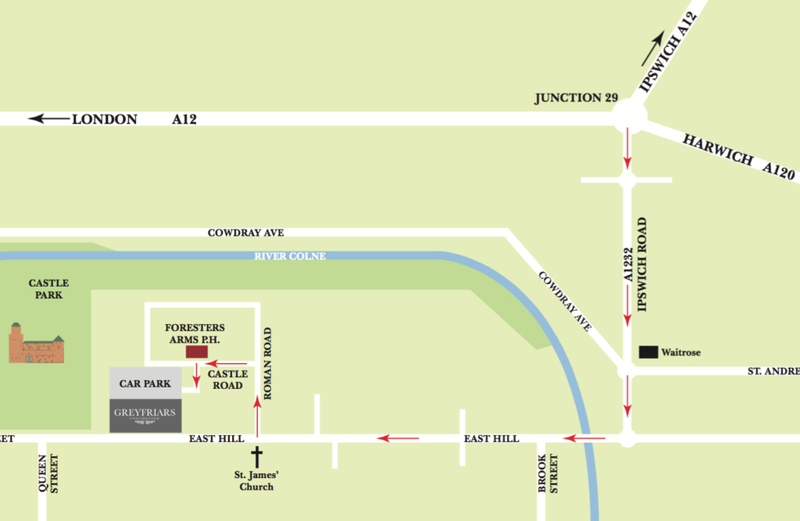 However, we do recommend entering Colchester from Junction 29 of the A12 as explained above, to avoid mistakes in the town centre’s one-way traffic system. Colchester is very well connected to the rail network, with direct trains serving Colchester from a variety of directions and numerous arrivals and departures each hour during the day. The journey from London Liverpool Street to Colchester takes 50 minutes on the fast train. Colchester North Station is the main station which is well served by taxis, as is the smaller Colchester Town station. A taxi ride from Colchester North Station will take between five and ten minutes, depending on the time of day. Just ask for GreyFriars at the top of East Hill and the driver will know your destination immediately. On arrival by Ferry from the Continent to Harwich International, Colchester can be reached either by direct train or by car. Travelling time by either method from Harwich to Colchester is 30 to 40 minutes (see directions for “By Car” overleaf).